“Inside the conference, I realized that Bolivia was in a position similar to that of the protesters outside. We, the representatives of the majority of the world’s peoples, were effectively being left in the cold while a tiny group dominated by a few rich governments met in private to produce an unacceptable compromise…which we refused to sign. The Conference was organised to give grassroots groups, and especially indigenous people, the chance to be in the spotlight and air their views on how to tackle the climate crisis. Bolivia pledged to bring the results of the meeting into the UN’s negotiating halls. Working groups on 17 topics discussed a variety of issues, and a summary of their conclusions was put into a 6-page Agreement of the People. Since the crowd of participants was so big, a closing ceremony was held in a stadium, and leaders of social movements and environmental groups shared the limelight with Morales, Venezuelan President Hugo Chavez and other political leaders from the region. The People’s Agreement called on developed countries to cut their greenhouse gases by 50% by 2020 (compared to 1990 levels). It also wanted the average global temperature rise to be limited to 1 degree celsius and greenhouse gas concentration in the atmosphere to be brought to below 300 ppm. These are ambitious targets which the participants argued are needed because of how serious the situation is. In contrast, the Copenhagen Accord goal is a limit of 2 degrees. At this level, says the People’s Agreement, there is a 50% chance of irreversible damage to the Earth, with many parts of the world becoming inhabitable. The Agreement also called for the establishment of an International Court of Climate and Environmental Justice to prosecute states, companies and people who are damaging the climate, and a global referendum on how the world should tackle the climate crisis. The Conference also set a target for developed countries to contribute 6% of their GNP to enable developing countries to take climate actions. Technology should also be made available at low cost to developing countries, which should thus be be allowed to exclude patents on climate-related technologies. The Agreement gives prominence to the Rights of Mother Earth and the need for humanity to live in harmony with nature. A prominent issue was water, reflected in the Agreement’s demand “to recognize the right of all peoples, living beings and Mother Earth to access and enjoy water” and that the right to water should be recognized as a fundamental human right. This emphasis on water is not surprising for two reasons. Firstly, the glaciers in the Andes are disappearing as a result of climate change, and this is having a severe effect on water supplies and agriculture in Bolivia and neighbouring countries. And secondly, it was in Cochamamba that the Bolivian “water wars” took place a decade ago, when thousands of people protested against the privatisation of the country’s water system to a foreign company. They were afraid that this would lead to higher prices of and reduced access to water. 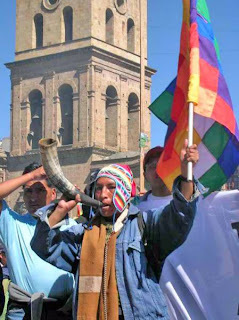 In the forefront of the protest were the indigenous people who comprise a majority of the population, and their leader Evo Morales, and this movement for the public control over water helped sweep him to power. According to a BBC report last week, climate change has led to irregular water flows in the Andes mountains of Bolivia, and the streams have become torrents or dwindle to just trickles. It quotes Max, an elderly Aymara Indian as saying: “We are very worried because we have no water. Half the people of this community have already left. Those who remain are struggling with the lack of water. This is the background to why Bolivia wants a world climate tribunal to be set up, so that cases such as this can be taken up and those causing the problems will be made responsible for restoring the environment and compensating the victims. “What we want to achieve is justice,” said Pablo Solon, Bolivia’s ambassador to the United Nations and the main organiser of last week’s conference. “When we say climate justice tribunal, we are speaking about how to sanction actions that seriously affect the environment and have consequences for populations, for nations that may even disappear beneath the ocean,” he told the BBC. “You might be on one side of the world, but what you do is affecting somebody else in another continent very far away…There might be, there will be, millions of people who are affected, and may even die, because of those actions. Martin Khor is executive director of the South Centre and former director of Third World Network. Republished from Climate Justice Now!